A long drive from Castlepoint to Cape Palliser to view the NZ Fur Seals in the Wairarapa, North Island, New Zealand. in the Wairarapa, North Island, New Zealand. Before leaving the town of Castlepoint, aptly named after the 162 metre high Castle Rock which sits overlooking the lagoon on one side and the coastline on the other, we took another walk up to the lighthouse to enjoy the view. The section of beach between the lagoon and bay is a hive of activity with 4 wheel bikes busy transporting people to fishing spots, tractors launching super large boats from the even larger trailers, and people enjoying the quaint (but busy) mostly holiday bach community. Soon we set off back towards the main road via the town of Masterton to begin our journey south, deeper into the Wairarapa district. We stopped off in the small town of Carterton to check out their claim to fame. There is a Paua Shell Factory which is one of the few places in New Zealand which takes the paua shells (aka abalone) and creates beautiful jewellery and souvenirs from it. There is also a video running on a loop which shows the visitor the process from diving to collect the paua to the finished products. We decide to take a short deviation from the main road from Carterton and head towards the Tararua Forest Park to take a short hike in the bush. To begin the hike one must first cross the rather wobbly swingbridge (one of New Zealand's longest) which is particularly tippy in the middle. Once on the other side we embarked on our short bush walk before returning across the bridge. 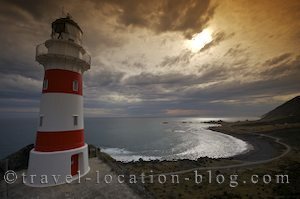 We made our way back to highway 2 then turned off towards Martinborough, a popular wine growing region, then onto Palliser Bay and Cape Palliser Lighthouse situated on the south east corner of the North Island. After climbing the 250 odd steps to the lighthouse and spending some time photographing the structure and coastline we made our descent of the stairs and checked out the nearby NZ Fur Seals vegged out on the rocks. There were a large number of very young pups and some mothers nursing while others were bathing in the water nearby. It is great to see so many young seals after the population was all but wiped out by hunting soon after the Europeans first discovered New Zealand. Leaving the seals to their own devices, we set up for a sunset shot along the coastal road before heading out to Wellington City. The journey to Wellington from Cape Palliser is around 2 hours, but we had a ferry to catch the next morning and wanted to stay close by.